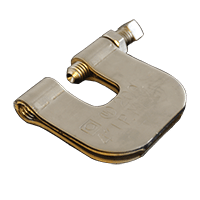 Series 110 Wide Throat Beam Clamp #113 – 101 113 – 101 3/8 inch 1 5/8 inch 2 inch 1/2 inch 1 inch 1 1/4 inch 7/8 inch 400 lbs. Series 110 Wide Throat Beam Clamp #114 – 101 114 – 101 1/2 inch 1 5/8 inch 2 inch 1/2 inch 1 inch 1 1/4 inch 7/8 inch 500 lbs. 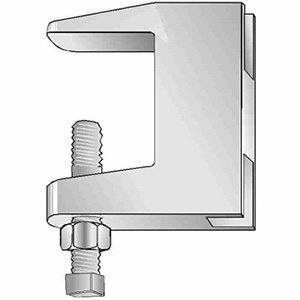 Series 110 Wide Throat Beam Clamp #115 – 101 115 – 101 5/8 inch 1 3/4 inch 2 1/4 inch 1/2 inch 1 1/4 inch 1 1/4 inch 1 inch 600 lbs. 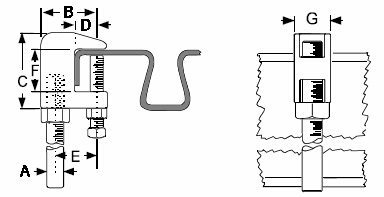 Series 110 Wide Throat Beam Clamp #116 – 101 116 – 101 3/4 inch 1 7/8 inch 2 3/8 inch 1/2 inch 1 3/8 inch 1 1/4 inch 1 1/4 inch 800 lbs.